Do We Need Obama in the Trump Resistance? We’ve got a president who wants to take away people’s health care, build a border wall, and ban refugees. Should Obama attack him directly? So—after the biggest march in American history, the first iteration of the Muslim ban, the second iteration of the Muslim ban, Paul Ryan’s failed attempt to finally “repeal and replace” Obamacare, late ethics reports for four out of nine cabinet nominees, President Trump defending Bill O’Reilly after accusations of sexual harassment, Attorney General Jeff Sessions connecting scrutiny of police departments with spikes in crime, press secretary Sean Spicer comparing Hitler favorably to Assad—President Obama has emerged from vacation, or whatever. And he used the momentous occasion to give an uninspired, nonpolitical speech about wanting to help America’s future leaders. 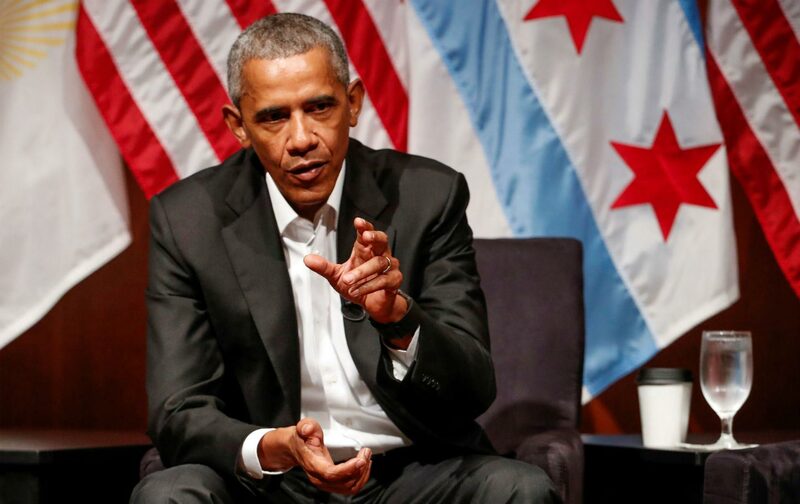 Speaking at the University of Chicago on Monday, the 44th president started his first public appearance since leaving office by cracking a couple jokes. Then he went into one of his favorite pastimes: expounding on how being a community organizer informed his career as a public servant. His public service isn’t over, Obama suggested, but it is, naturally, shifting. “I’m spending a lot of time thinking about: What is the most important thing I can do for my next job?” he said. He had, he told us, settled on “preparing the next generation of leadership to take up the baton and to take their own crack at changing the world.” He was light on the details—so far, the former president hasn’t announced plans to start an organization focused on this issue. And it’s not the only one Obama has said he’ll be focusing on: He is planning to work with his friend and former attorney general Eric Holder at the National Democratic Redistricting Committee, an organization devoted to curbing gerrymandering and securing a fair redistricting process. In February, Holder promised Obama would be a vocal and active participant in the organization, telling the press that the former president is “ready to roll,” and that he’ll “be a more visible part of the effort.” But it’s nearly May and the former president hasn’t been visible at all. Now that he’s resurfaced, it’s fair to ask: Is preparing the next generation of leaders and working on redistricting really the best use of Obama’s talents? If Donald Trump wasn’t in the White House, I’d say, “Do whatever you want, man.” After leaving office, presidents have embraced a range of post-presidential activities: George W. Bush devoted his post-presidential efforts to becoming a painter of world renown, while Bill Clinton started his own (albeit controversial) philanthropic foundation that credits itself with making AIDS treatments more affordable and getting American public schools to get rid of sugary drinks. Jimmy Carter became a more respected leader after his presidency, picking up a Nobel Peace Prize for his humanitarian work in 2002. But those were different times. Now we’ve got a president who wants to spend millions on a wall to keep people out, wants to ban refugees, and has employed a white supremacist as a top adviser. He’s a man who doesn’t adhere to any political norms or orthodoxy. And that makes Obama’s voice that much more valuable. It is true that former presidents have historically avoided criticizing one another. But Trump has proved, almost every day since he announced his candidacy, that he is not one for standing on ceremony. In December, Trump attacked Bill Clinton on Twitter after he said Clinton misrepresented a phone call the two had. “That’s one of those many, many unwritten rules otherwise known as norms that Donald Trump has abandoned,” Thomas E. Mann, a scholar at the Brookings Institution, told The Washington Post. And the other former presidents have broken with tradition and found time in their busy post-president schedules to make their views on the current administration known. Last July, Carter said Trump “seems to reject the most important moral and ethical principles on which our nation was founded.” Bush didn’t even vote for Trump, and Bill Clinton has not exactly been quiet about the guy who bested his wife on Election Day. Obama and his advisers don’t want him to enter the fray. “Mr. Obama and his advisers also have concluded that confronting Mr. Trump now would be a political mistake,” The New York Times reported. “If Mr. Obama were to challenge the president directly, the former president would become a foil for Mr. Trump’s efforts to rally his supporters. That could end up helping Mr. Trump enact policies that Mr. Obama opposes.” Obama may indeed be a lightning rod for the right, but would a backlash among Trump supporters really outweigh the energy of the left and liberals? For my part, I feel a visceral desire for that first black president, who left office with a high approval rating, to defend the policies and laws enacted during his presidency instead of standing idly by as they are destroyed, and I can’t imagine I’m alone. Still, there may be risks to taking on Trump directly, and there’s another route that doesn’t require outright confrontation. Obama can do what he does best: teach. He is a gifted orator, as we learned back in 2004 when he appeared on the national stage for the first time. He’s known for his deliberative approach to vexing problems. In 2015, Obama stood in front of a crowd in Newark and spoke about how the criminal-justice system was negatively impacting millions of Americans. The former president didn’t blame or vilify law enforcement or incarcerated people, but took a measured and balanced approach to reform. We need that voice now, too. Finding a middle ground, in which the president devotes his energy to educating the public and pushing for a substantive cause connected to his presidency, might be the best approach. The cornerstones of Obama’s time in office were the Affordable Care Act, steadying the economy, and addressing climate change. Reinvesting in health care or climate change would be a significant rebuke to the current administration, but not quite the outright ad hominem attack on a sitting president. Such a campaign could preserve Obama’s legacy while catapulting the liberal agenda forward.